From the frigid winter temps to blazing summer heat, Illinois is faced with a wide range of temperatures. While this can be very beneficial for everyone seeking out “seasons”, the temperature extremes can wreak havoc on the comfort of your establishment. Building insulation happens to be a simple yet powerful procedure that can provide numerous benefits for any home or business. In our last blog, we discussed a few benefits fiberglass insulation and how the process can help to make your life better. Today, we’ll continue this discussion with a few more benefits you can expect once your insulation services are completed. AZ Drywall Finishing is proud to be your drywall and insulation contractors in the Chicago area. Our experienced team is here to help you reduce your energy costs up to 40percent! Installing certain types of acoustic insulation for walls and ceilings can help to reduce the amount of noise travelling through your business. Special options are available for companies looking to aggressively minimise the noise in their establishments. Your typical insulation batts will also help in reducing sound transference by creating friction between air particles and the fibers that sound waves will travel through. It’s important to note that your standard insulation materials will reduce sound a little bit but not block it. Materials such as concrete blocks and gypsum boards are your best bets in the fight against sound, where dense products prevent sound transference. If your business is in need of acoustical insulation services, give us a call! Our team will be happy to help with all of your company’s insulation needs. One factor that many property owners do not take into account for their building is the aspect of moisture control. Insulation can actually be seen as the first line of defense against moisture due to it’s ability to stabilize temperatures and dew points. When the inside of your structure reaches the dew point temp, condensation can form wherever the temperature conditions are met. While have moisture in your air, the opposite tends to be true. Any water content that forms inside your building can create the conditions for mold, which is a major health concern. Going green is one popular action that many businesses take on to improve both the environment and their images. Being conscious of our impact on the world can prove to be very helpful in making the Earth a better place. A portion of all fiberglass is recycled, limiting the rate of consumption for raw materials in our society. Additionally, the benefits of temperature control also reduce the amount of energy needed to heat and cool your home or business. Saving on both the energy costs and amount of chemicals involved with air conditioners will help to reduce your carbon footprint and make your enterprise appear much more environmentally responsible. 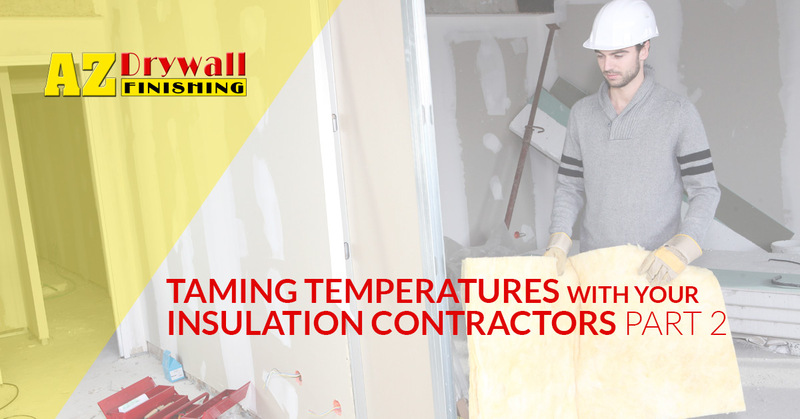 Hiring one of the professional insulation companies in your area can prove very beneficial for a number of reasons. If your building’s insulation is worn down or is dealing with damages such as mold, we can help! AZ Drywall Finishing is proud to hire and train the best insulation contractors for your Chicago business. Since 1999, we’ve specialized in drywall and fiberglass insulation services to improve costs and comfort across Illinois. If you are in need of quality insulation assistance, contact us today to get a free quote!